A project to monitor the condition of archaeological Sites & Monuments in the war zone of the Luhansk region (Eastern Ukraine) was organized by the Ukrainian Helsinki Human Rights Union (UHHRU) and the International Partnership for Human Rights (IPHR). Our team was composed of myself, Sergey Telizhenko (Institute of Archaeology NAS of Ukraine), Olexii Bida (UHHRU), Dmytro Koval (Odessa National Academy of Law), and Natalia Kaplun (Luhansk regional museum). The team was augmented by two members of the IPHR group. Together, we worked to gather evidence of artillery shelling of Ukrainian cultural assets and catalogue other damage such as the digging of military trenches, and assess from which group of combatants (Russian or Ukrainian) were responsible for particular damage. For our mission, we chose three districts of the Luhansk region – Stanichno Luhanskii, Novoaidarskii, and Popasnianskii. Also we visited the city of Lisichansk where a large barrow (6m in diameter) is situated in the heart of the downtown area. Our team has examined some 30 different archaeological sites. Of these, 15 had sustained some form of damage, including nine that were the direct result of military actions. For example, in the districts of Novoaydarskii and Popasnianskii several barrows were used as shooting ranges, and in some cases fresh pits were visible in the tops of the barrows. A number of barrows near the city of Toshkivka were partially destroyed by the insertion of military trenches and scarps. A number of these barrows were hit with a variety of projectiles, including missiles fired from BM-21 “Grad” truck-mounted rocket launchers. The impact craters measure up to 3m in diameter and up to 1m deep. The conclusions drawn by our partners from IPHR was that the points of origin for the shelling was chiefly from the southeast, i.e. the territory occupied by Russian troops. As part of the process of evidence retrieval and documentation, we collected numerous parts of rockets and shells. Several barrows near the village of Kamyshevaha (Popasnianskii district) were shelled with heavy ordnance. Here too, the resulting craters are deep and caused extensive damage. The multi-period site of Kapitanovo-I was shelled from the south-east. Factory identifications on several of the recovered portions of rockets indicate that the shells were fired from a BM-21 “Grad”. On the disturbed surface at Kapitanovo-I our team recovered a clay figurine dating to the Copper Age. The multi-period site at Zanivske-I, which I have worked on since 2000, was also hit, but only once. In the shell crater on the site we are recovered a Late Neolithic flint flake. Part of the project include a series of interviews with the local populations. It was from them we learned that some of the Bronze Age and Medieval settlements in left bank of the Siversky Donets river are seeded with explosive mines. This information was backed up by the Ukrainian military, who advised against surveying these sites, many of which were in areas held by Russian troops, over fears for our safety. We also noted that the regional government has done little to detect and prevent the destruction of archaeological objects in areas that are away from the immediate war zone (gray area). We observed fresh holes dug by treasure hunters on the tops of almost every barrow we surveyed. The previously mentioned large barrow in downtown Lisichanskhas been severely pitted by treasure hunters and has been used as a local dumping ground. In the city of Lisichansk we were particularly surprised to record the destruction of many late nineteenth and early twentieth century buildings. This is an area that has been relatively free of military activity and the selective destruction of these buildings appears quite illogical. We also visited the museum in Stanichno Luganskaya, currently among the towns most exposed to attacks. This museum was directly shelled on several occasions from BM-21 “Grad” vehicles, when the local population sheltered in its basement. Portions of the museum’s collections were also stolen during the fighting. The findings of our mission are currently being written up and will be presented in a special report. Below: Barrows near Toskivka, Popasnianskii district, showing various excavated trenches, escarpments, shell craters, and recovered military fragments. In the final session of the day the chair, Dr. Nóra Bermingham, introduced the first speaker, Ian Riddler. His recent work has included a re-examination of Early Medieval combs from Ireland. He began by noting that the act of combing of hair would have been a very private and intimate act and would have been undertaken outdoors, away from other people. However, the finished product – the hairstyle – would have been a very public result. Even if the hair is covered, the act of covering is itself a very public statement. In this way, he argues, combs fit somewhere between this private act and the public appearance. In this way they can give information about attitudes towards grooming, hygiene, and personal care. They also provide excellent dating evidence, they provide evidence of craft, and they provide an index of identity, along with indirect evidence of changing hairstyles and fashions. Using a diagram of the dated phases and occupation levels excavated at Fishamble St, Dublin, Riddler explained that he counted the numbers of ten classes of comb recovered from each level. Although repeatedly describing the image as ‘incomprehensible’, Riddler explained that a number of important insights could be identified. The first of these is that the different classes of comb overlap in the periods of their popularity. There is no real sense that one particular style dominated and was immediately replaced by another. Additionally, by the time of The Battle of Clontarf in 1014 there was a particularly wide range of comb available to the prospective user, some seven of the ten tested. However, 50 years later the number of classes has diminished to just two. Obviously, something significant has happened in the intervening period! In terms of Drumclay, Riddler explains that the first part of the analysis has been to take the excavated combs and set them in broad sequence, not related to the stratigraphy & working independently of all other analyses. He also notes that Drumclay wins out over Deer Park Farms (and the majority of Irish rural sites) in that it does have a recognisable sequence. Showing an image of the famous ‘bird’s head’ comb, Riddler states his opinion that it is among the earliest from Drumclay and dates to the 7th to (maybe) early 8th centuries. Unfortunately, there are not many of these combs known and they are poorly dated. However, by the 8th century the Drumclay sequence is particularly strong. He explained much of the linkages between the examples from Drumclay and the corpus of finds from Deer Park Farms, and tied it to the Dublin sequence. While the common perception is that the Irish comb making tradition dies out in the early 10th century due to the massive Scandinavian influence. At that point, the argument goes, the tradition changes (‘almost overnight’) from the Irish double-sided comb to the Scandinavian single-sided comb. However, nothing is ever so simple and Riddler explains that there is a spectrum that goes from pure Scandinavian combs, through good Irish copies of Scandinavian combs, and on to Irish takes on Scandinavian combs. As noted previously, in the post-Clontarf world, the numbers of available comb styles drop dramatically. Riddler points out that it is due to the removal of the pure Scandinavian end of the comb-making spectrum. Speaking about one type of comb from Drumclay where the form may be paralleled at other sites but the exact style of decoration couldn’t, he mentions a similar example from Knowth, Co. Meath. In both cases he is of the opinion that local comb-makers are making combs to the prevailing Ireland-wide forms, but using local ‘signature’ decoration. Drumclay comb-making continues into the period from 1175-1250 and excavated examples can be paralleled at sites such as Greencastle, Co. Down. However, composite comb design essentially ends in this period and the evidence from Drumclay similarly diminishes. While, at the time of the conference, this sequencing was not complete, the next stage in the research would be to integrate this research with the stratigraphy. With regard to the distinct Drumclay ‘signature’, Riddler notes that it is defined as an un-banded but fairly-closely spaced mesh. This has been observed on at least five different comb designs from the site. He emphasises that this discovery is of significance as it is particularly difficult to distinguish regional patterns in Irish combs. 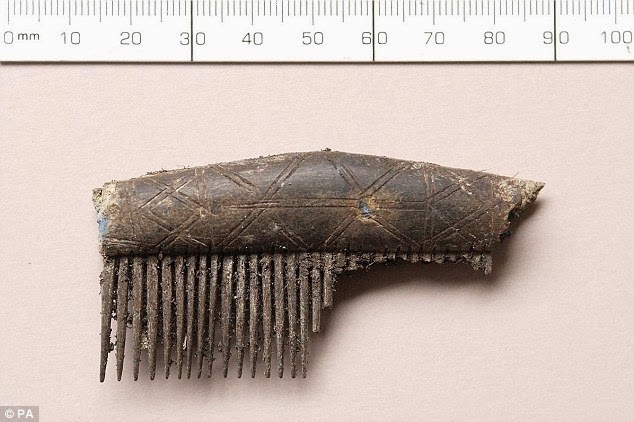 A comb with very similar decoration is known from Pottiagh crannog, near Clones, Co. Fermanagh. 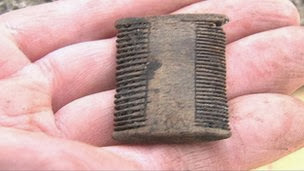 Riddler suggests that it could either be a Drumclay comb or evidence for a slightly wider, regional ‘signature’ than was used by more comb makers than those at Drumclay. In either case, he identifies it as an area deserving of further work and research. Turning to the question of whether combs were actually made at Drumclay or just used and deposited there, Riddler notes that apart from the distinctive Drumclay ‘signature’ there is a small collection or recovered antler waste. This suggests that comb making was carried out at Drumclay. He argues that that the large piece of antler shown by Emily Murray in the previous lecture was actually used as a pick, rather than being a piece of waste. While the amount of antler waste from Drumclay is small, this is typical for rural Irish sites. Reasons for this include the fact that a favoured place for deposition (along with the other site detritus and filth) is in localised areas of enclosure ditches. For Example, at Castlefarm I, Co. Meath, the majority of the antler waste was confined to a very small number of locations and, could have easily been missed had trenches been placed in slightly different locations. Antler shavings survive relatively well and can be easily recovered from soil samples and, again, even small numbers of shavings are evidence of antler working on a site. Riddler notes that on Raystown, Co. Meath antler working is evidenced from a very small number of antler shavings. There is also indirect evidence of comb making at Drumclay in the form of one very poor example from the site. It has poorly cut teeth that are ungraduated and uneven and Riddler believes it to have been abandoned by an unskilled craftsman. Riddler also points to particularly well-made combs from the site, including one of the longest known from Ireland at 230mm. 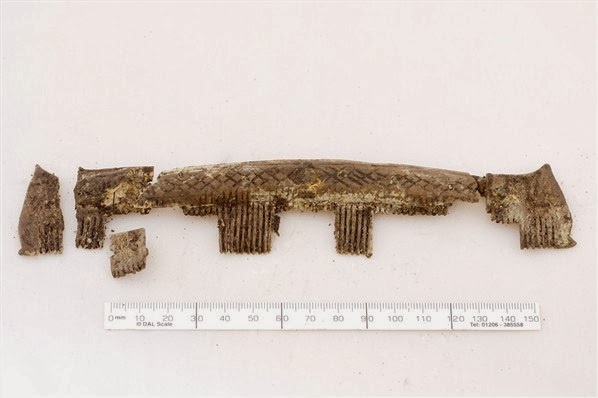 It may be paralleled with three combs from the High Street excavations in Dublin, including one of about 15inches in length making it the longest from Ireland and among the longest from all of Europe. As all of these combs show evidence for use, it raises questions around ideas of deliberately ostentatious display. Originally, due to their size, these combs were thought to have been for horse grooming rather than human use but as Riddler says: “I wouldn’t go round the back of a horse with a 15 inch comb – that would be madness!” Indeed, modern horse combs are much smaller (around 4 inches) and bear more resemblance to some of the smaller combs from the site. For Riddler a key point is that the long combs are chronologically contemporary – or at least they appear so in the archaeological record because the resolution of the dating evidence cannot match the speed of changes in hair style fashion. A biography of Archbishop Anselm, who died in 1109, noted that “the men with long hair whom Father Anslem had banned from the threshold of holy church avowed to such a degree and gloried so much in the wickedly long feminine hair that whoever is not long haired is called as an insult ‘peasant’ or ‘priest’.” This is paralleled in accounts of the Battle of Hastings where King Harold’s scouts reported that the Norman soldiers were ‘all priests’ because of their short hair. In this way, one’s profession or vocation was visibly demonstrated in the hairstyle adopted. As part of the UK Festival of Archaeology, Dr Greer Ramsey, Curator of Archaeology, will give two illustrated talks highlighting a number of key objects from the collections. This illustrated talk explores several stunning items of Bronze Age gold jewellery on display in the Ulster Museum. This illustrated talk highlights some of the most significant objects on display in the Ulster Museum. Admission is free but advance booking is advised For further information please contact 028 9044 0000 (10.00am-5.00pm Tuesday–Sunday).